We have a U2 Mirage Simulator available for sale. The unit is used but has been fully reconditioned and is in fantastic condition. The unit is located in Europe and is available for immediate shipment. 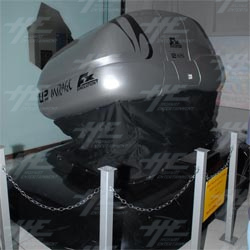 The U2 Mirage is a 2-seater simulator manufactured by FX Simulation. The machine has a choice of six rides and features a fully darkened enclosure, gull-wing doors, and a hydraulic motion base. The machine comes with a 36 inch monitor inside the unit, as well as a 14 inch external display situated in the point of sale unit. The machine is fully coin operated and no attendants are required. For more information about the machine, including photos of the actual machine, Click Here or contact one of our sales staff.